In preparation for getting my road bike ready for sale, I recently visited Steve Gardner. 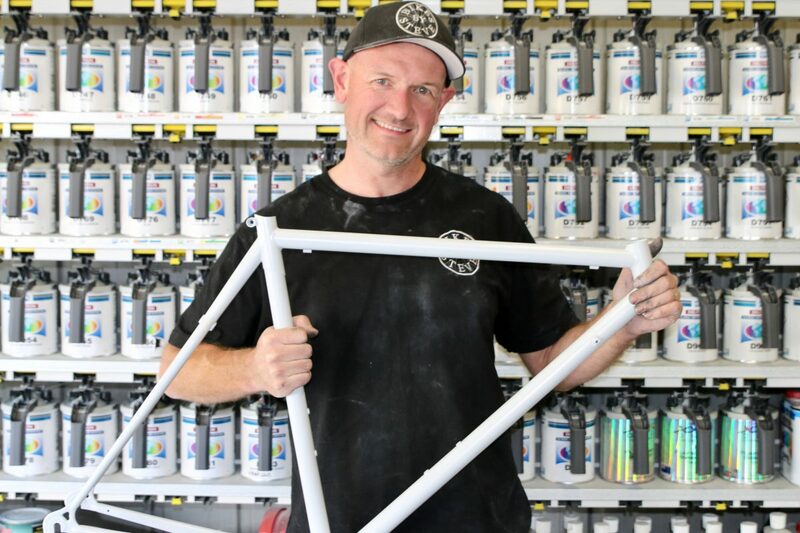 Steve specialises in painting bike frames and paint restoration. 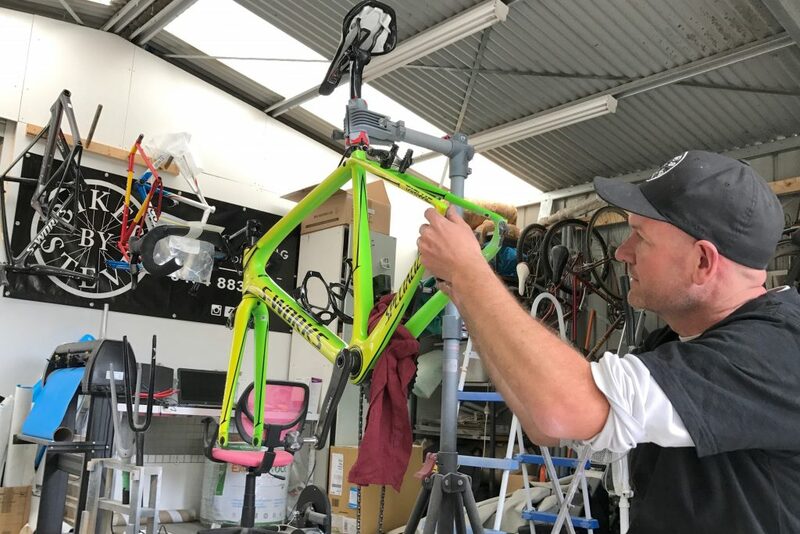 This article describes the services Steve offers to businesses or individuals looking to paint and/or repair paintwork on their bike. Let me paint (pardon the pun) a little picture for you. It was 2015. I had just ridden in the Shimano Super Crit and I’d come off my bike at just over the 1-hour mark. If you’ve participated in or watched the Shimano Super Crit in Melbourne you will know that it gets hairy. On this particular day there were just over 130 starters. My day came to an abrupt end where the barricades start narrowing into the finish line area. I was OK, but the bike was definitely scarred. Multiple riders had gone over me as I hit the deck, with their bikes scratching parts of my black Specialized S-Works frame. After the dust had settled from the day, I took the bike into my local store – Hampton Cycles – to assess the damage. While the bike was structurally good, the scratches and marks on the frame were aesthetically demoralising. My beautiful black beauty was scarred! 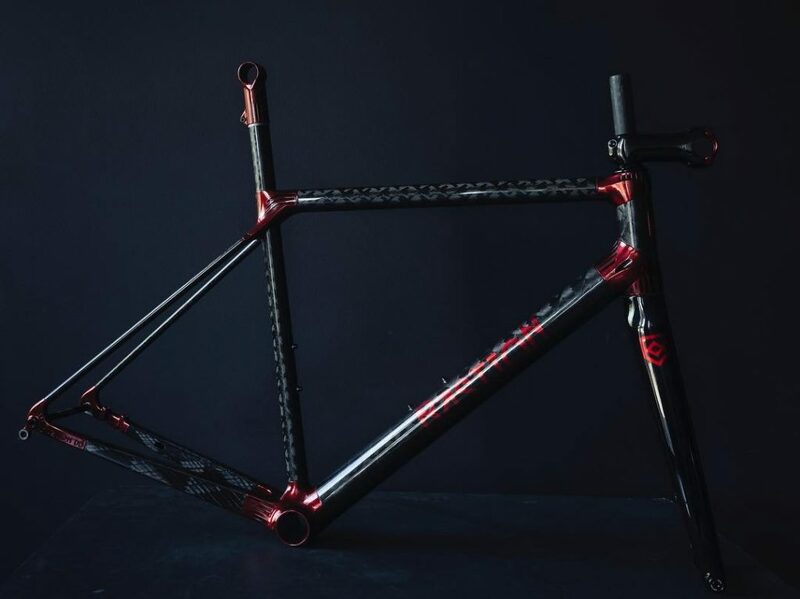 If I wanted to get the frame fixed up – Hampton Cycles recommended we strip the bike, put it in a box and ship it all the way to Queensland to Paint My Bike. We’re in a city of almost 5 million people, the capital of cycling in Australia, and there’s no one local who can solve my problem? I was handed the number of a local guy who did some frame painting work on the side, but after a very poor communication experience with this fellow and putting shipping bikes to different states in the too hard basket, I decided to sell the bike at a bargain price (given the frame marks) several months later. Steve heads to Bastion and uses one of their custom booths to paint Bastion frames 1-2 days a week. Fast forward a couple of years and I’m selling another bike. However, this time my need to touch up the paint job hasn’t occurred from a crash or the bike hitting the deck. It’s stone chips that have destroyed a fluoro paint job on a different Specialized S-Works frame, which I’ve personally found a little disappointing. But that’s a story for another day. Once again, I was at my local bike shop asking for their guidance on how to get the paint job fixed. “Please don’t tell me I need to send this to Queensland again”, I pondered. This time round I was told of a few people who now offer bike painting services locally, with a recommendation to try Steve Gardner. Later that evening I emailed Steve a couple of pictures of the damage on my S-Works. He responded within minutes and I was on my way to Upper Beaconsfield (near Berwick) the very next week. After 20+ years of painting cars Steve was looking for a change of scenery. With a growing demand in custom bike painting, a passion for cycling, and a very transferable skillset, Steve left the automotive trade behind in May this year (2017) to pursue custom bike painting. Fast forward 6 months and Steve is working with multiple brands here in Melbourne, such as Bastion, Luescher Teknik, and Curve, all while word of mouth has been filtering through the cycling community, meaning Steve is also very busy with frame restorations, such as my personal need with the S-Works frame. Steve uses a PPG painting system with an multitude of guns he can take to any task – whether that be steel, aluminium, carbon or titanium. Assessing some of the work – outside of my touch up job – Steve’s skillset as a bike painting guru shines through. Take yourself to the Bastion Cycles Instagram page and you’ll soon get a good feel for the complexity and execution. Another beautiful Bastion frame painted by Steve. Steve thoroughly cleaned the bike in order to assess how far the damage went. He then feathered out the paint scares, and spot primed the areas before painting. In order to speed up the drying process he used a set of accelerated hardeners for the clear coat and then infrared lights finished the job before a final polish. My own personal experiences with Steve were seamless and well executed. The communication process was efficient, the experience of dropping the bike and picking it up was easy, and the execution of the frame chips and marks were flawless. If you’re in need of any paint work on your bike, we’d highly recommend @bikes-by_steve. Steve spends a fair amount of time assessing the damage before he decides how to tackle paint scars. very wonderful art of painting body of bikes, very creative! and the compination of colors are very stunning! What a great article & with 9 ‘semi-vintage’ (mid-80s to early ’90s) frames that I need resprayed from either bare carbon fibre or bare steel (the latter a newly custom built Columbus AIR frame – exact replica of Greg Lemond’s famous red/white 1989 Bottecchia TT frame), as well as a couple that simply require new decal sets applied upon them before ALL of the 9 frames are coated in PPG’s awesome Ceramiclear clear coat, I am now RAPT that a) I no longer have to ship these frames to Brisbane, b) I don’t have to try to mend a ‘bridge’ with my previous frame painter in an outer Melbourne suburb, following a miscommunication re: what I wanted from my first ‘semi-vintage’ frame restoration (I can’t help but wonder whether it was the same guy referred to within the article above?! Was that painter also named Steve, perhaps?!) & c) having completed a panel beating apprenticeship at a Honda dealership in the mid-90s, I certainly like to think that I’m better equipped to judge a painter’s prerequisites than most people – and ALL of the signs are this Steve sounds like absolute quality in all respects – plenty of experience & talent, he uses advanced PPG paints/clear coats & perhaps most important of all – he sounds like a great guy to deal with!! I’ll be sure to return to this page after having dealt with this ‘new Steve’ & hopefully my review with be as sparkling & dynamic as his paintwork!! I think that I’ll email him later today, just to touch base & send out the feelers re: turnaround time & costs!! Thanks HEAPS for this AWESOME & VERY TIMELY article…cheers & best wishes…Matt. Hello how much does it cost to repaint a bike frame? How much it cost aprox to repaintt my Cervello One frame? We want to paint our bicycles frames into blue colour. 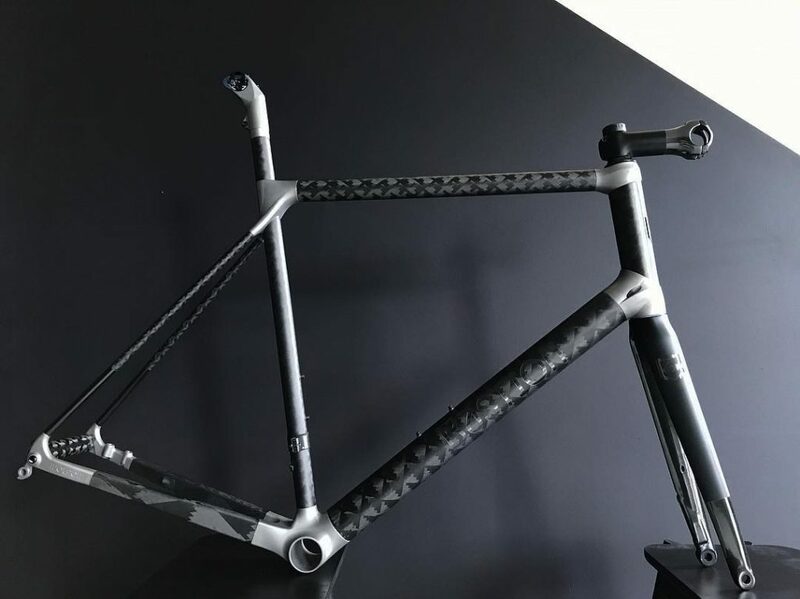 Only the frame area and in one colour. And there are ten bicycles need to be done. The bicycles have been assembled. The bicycles are located in Melbourne. Please give me a quote. Thank you.